For Honey Palladino, the holidays have lost their magic. She is sure her husband is cheating on her. Her daughter plans to spend the time with a friend. Her widowed mother sees the image of Jesus in a live oak tree. As if that's not enough, her mother is also talking about going on a Christmas cruise with some old geezer, without benefit of marriage. That would be right after she signs away the family business - the real estate agency Honey's father built into a company worth millions, the job to which Honey has devoted her life. At her mother's condo in Boca Raton, Florida, many have recently lost a spouse and are now with "significant others", and Honey is intrigued by the promise of new love, even at an old age, but doubts she'll ever find another significant other after her inevitable divorce. When her mother reunites with a lost love from years before, Honey is completely undone, but the "Jesus tree" puts into motion a series of holiday miracles. Discovering what's important in life brings a message of hope for lovers of all ages. Significant Others by Marilyn Baron is a heartwarming story filled with secrets and second chances. I loved the original storyline, and the age bracket of the characters. The author did a wonderful job painting the imagery in this book. Kathleen Li was amazing bringing the characters to life. She has distinguishable voices for the numerous characters and has realistic emotions for the situations. I really enjoyed this book and will most definitely listen to more books by this author and narrator. I requested this review copy audiobook and have voluntarily written this review. 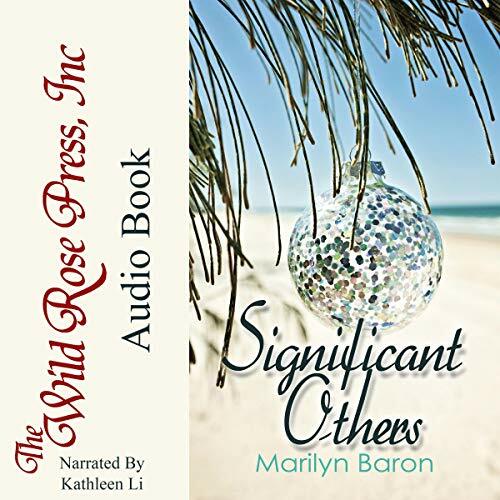 A fun and quirky listen Marilyn Baron hits home with Significant Others. Honey is a woman I could easily relate to. She is trying to preserve her family legacy, deal with an aging parent and is unsure of her marriage. I loved all the characters in this, from mom, Dee Dee who is seeing Jesus in a tree(despite that she is Jewish! ), to Donny the famous baseball player. We get to see second chances at long lost love and reconciliations. It's a story that spans several generations, and the intricacies of the family unit while specific to this story can easily translate to any family. Slight dysfunction, happy memories and finding your true self and love all resonate. It's an easy, fun and humorous listen. Kathleen Li narrates this large cast of characters with discernible voices and comedic timing. She is also able to emote the seriousness of situations just by changing her inflection and it gives the story a true feeling of realism. It's my first narration by her, and I enjoyed her pace and her performance. This book is enjoyable to listen to. It was funny and the story moved along at a good pace. I was not expecting how the book ends. I enjoyed listening to Significant Others book very much. The story had love and loss and real life issues as well as second chances. I have not read or listened to many books where main characters are over 30 years old and I really liked that this book had mature characters. It was great to listen to story where women after 50 are not portrayed as funny granny or grumpy side characters, but full of life, love, hopes and desires. Narrator did a great job bringing all the characters to life and I loved listening to her voice telling the story. This was my first book by this author and narrator and I am looking forward to listening to more books by this author/narrator team. while the storyline is not unique, it is likeable. what kept me listening was the audio perfomance. the clear voice. well enunciated, making emphasis in the right places while giving each charter depth of identity. Enjoyed the book. Most of all, enjoyed the clever narration. Writer and narrator make a dynamic duo! Significant Others , I have to say I was drawn to the audible book from the first chapter . The story had me laughing , smiling , and then a blubbering mess . Happy tears and some sad but what a beautiful story . The author knows how to take many topics and bring them to light with such respect . I absolutely enjoyed the book and the cast of characters . This is a clean book and does not have any bad language . The book has it all ! Romance, secrets , and a retirement community that is a 21st century Payton Place . ha ha ha .. " Drama " I give the book 5 stars ..
Narrator Kathleen Li , brought the book to life every page she acted and read . Marilyn Baron has written an outstanding story! It had all different emotions that will tug on your heart. Kathleen Li brought it to the table with her voice. I would recommend her for any book to narrate! It is a wonderful, down-to-earth story about a family and their connections to various people in their lives and I personally feel that it can be read and enjoyed by any adult. It is told with so much humor and feeling that even though there are some sad parts in it, one still comes away feeling really good. The narrator, Kathleen Li, has done a great job. She captures the personalities of each of the characters really well and it enhances this well written story. I am so glad that I requested and listened to this audiobook - I simply couldn't put it down and am more than happy to recommend it to you. My voluntary review above is unbiased.